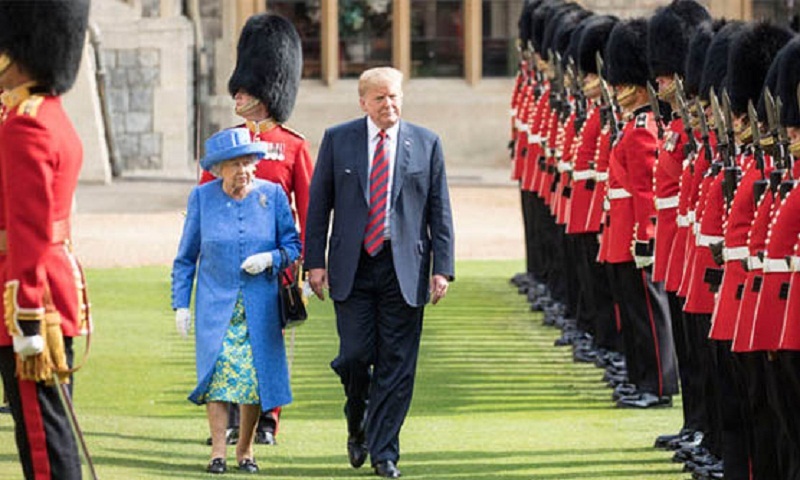 US President Donald Trump has seemingly breached royal protocol by discussing his private conversation with Queen Elizabeth II who he says thinks Brexit is a “very complex problem”, according to an interview with British media. The convention-shredding president, who had already attracted ire ahead of his four-day visit to Britain by rebuking Prime Minister Theresa May as she struggles over Brexit, met the Queen on Friday at Windsor Castle. He later told TV host Piers Morgan that they had discussed the UK’s controversial exit from the European Union. “She said it’s a very — and she’s right — it’s a very complex problem, I think nobody had any idea how complex that was going to be,” he said according to an interview published by the Mail on Sunday. “Everyone thought it was going to be ‘Oh it’s simple, we join or don’t join, or let’s see what happens’,” he said. Trump said he also told May that the UK should obtain a Brexit “carve out” from the EU to allow them to do a comprehensive trade deal with America. Despite a series of diplomatic spats between Britain and Trump, May is hoping for a quick trade deal with the US after it leaves the EU. “I said (to Theresa May), ‘Make sure you have a carve out, you have to have a carve out’ where no matter what happens they have the right to make a deal with the United States,” Trump said in the interview. The US president also repeated his claim that he had given May an “option” to give the UK an advantage over the EU in Brexit talks, without saying what that option was. Trump is now staying at one of his luxury golf resorts in Turnberry, southwest of Glasgow, on a private part of the trip before heading for a summit with Russian President Vladimir Putin in Helsinki. The president largely managed to avoid mass protests planned for his visit, and has shrugged off the organised demonstrations, which on Friday included a giant baby-shaped balloon bearing Trump’s features. May weathered the resignations of her Brexit and foreign ministers last week over her proposals for Brexit. Prior to his arrival in the UK, Trump scorched her policy towards the EU divorce in an interview with The Sun newspaper that shocked Britain’s political establishment. Both leaders tried to brush aside Trump’s incendiary language at a news conference Friday, insisting they were determined to pursue a post-Brexit pact.